Join the celebration as the new St. Croix Crossing Bridge opens! 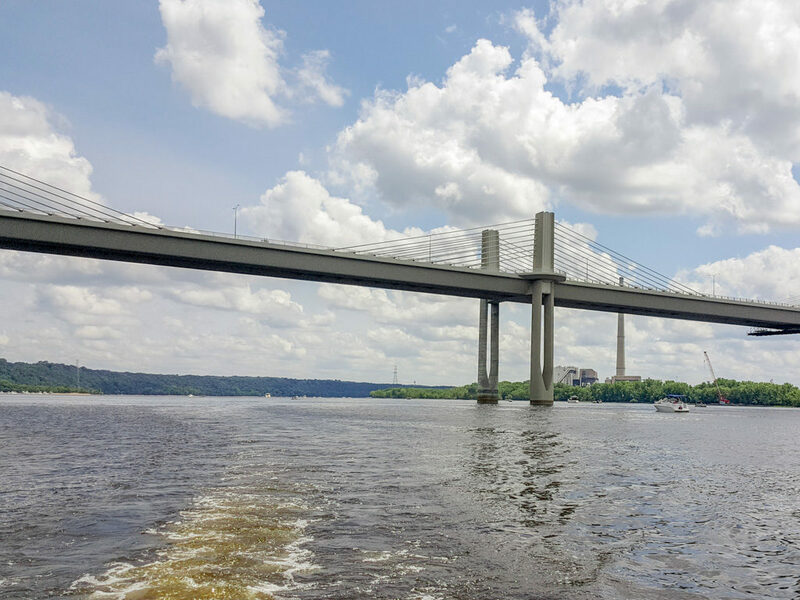 MNDOT and the City of Stillwater are hosting events to celebrate the opening of the St. Croix Crossing Bridge, and honor the long service of the beloved Stillwater Lift Bridge as it closes to convert it to a bicycle/pedestrian bridge. The Ribbon Cutting Ceremony for the new St. Croix Crossing Bridge is scheduled for Wednesday, August, 2, 2017, at 10:00 am on the Minnesota side of the new bridge. Governors and state and local officials from both Minnesota and Wisconsin will be in attendance for the one-hour ceremony, and this event is open to the public. The new crossing, connecting Oak Park Heights, Minnesota and St. Joseph, Wisconsin will provide a better, larger route between the states that will replace the more than 80-year old Stillwater Lift Bridge. It will ease congestion in downtown Stillwater and is anticipated to be a boon to economic development in the region. The dedication ceremony to mark the opening of the St. Croix Crossing bridge will be held Wed, Aug. 2 at 10 a.m. on the west end of the new bridge, eastbound lanes. No public parking will be available at the dedication site. However, parking at nearby locations on both the Minnesota and Wisconsin sides has been identified and shuttles will be provided to get to the location of the dedication. Shuttles will begin transporting individuals to the event location from the Wisconsin side at 7:30 a.m. and from the Minnesota side at 8 a.m. They will run as needed until 9 a.m. on the Wisconsin side and until 9:30 a.m. on the Minnesota side. Shuttles will resume approximately 30 minutes after the dedication ceremony ends to return to parking locations. The last shuttle will depart approximately 60 minutes after the dedication ceremony ends. Fury Motors (old car lot) located at the corner of Osgood Ave. and Hwy 36. Starting at 6:00pm the same evening (August 2nd), the City of Stillwater and civic leaders are partnering to expand the already scheduled “Cruisin’ on the Croix” classic car show to a public festival billed as “Cruisin to Closure” to celebrating the closing of the historic lift bridge. “We don’t know what time MnDOT will throw up the ‘bridge closed’ sign and do the permanent traffic shift, but we’ll be downtown celebrating until they do” stated Kozlowski. The Greater Stillwater Chamber of Commerce members are celebrating this huge milestone by offering “Bridge-Bash-Specials” to invite folks into local establishments to celebrate this historic time. Check out some great deals here. “Businesses are optimistic about these two historic milestones, the opening of the new bridge, and the closing of the lift bridge. I believe locals will reunite with their hometown with easier access to downtown and the surrounding areas. No more sitting in traffic. More local shopping, visiting our fabulous restaurants, and enjoying the small-town experience, the reason why many of us live here,” says Executive Director, Robin Anthony. The Lift Bridge, spanning the St. Croix River, will be converted to a bicycle/pedestrian crossing and will also become part of a five-mile “loop trail” system connecting the new river bridge with the historic bridge. The Lift Bridge will continue to operate to allow boat navigation beneath. Project work is anticipated to be complete by spring 2019. "It has been my experience that real estate agents, when trying to obtain clients, will sometimes over sell themselves and then end up underperforming. I did not find that to be the case with John and Becky... continued"